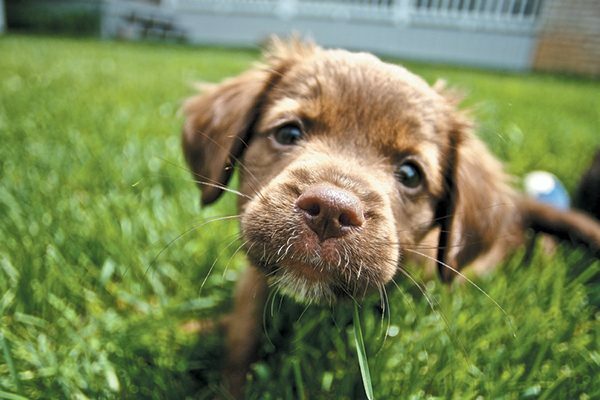 The post 12 Ways to a Dog-Friendly Backyard by Nikki Moustaki appeared first on Dogster. Copying over entire articles infringes on copyright laws. You may not be aware of it, but all of these articles were assigned, contracted and paid for, so they aren’t considered public domain. However, we appreciate that you like the article and would love it if you continued sharing just the first paragraph of an article, then linking out to the rest of the piece on Dogster.com. It’s easy to make your backyard safe and fun for your dog. After all, both canines and humans enjoy outdoor play more than emergency vet visits. Here’s a quick refresher on how to keep yard time game-on. Don’t give your dog the independence to run all over your neighbor’s yard. Photography ©MinnickMedia | Getty Images. Allowing your dog to play loose in an unfenced backyard can be problematic for even the most trained of dogs. He might be tempted to leave the yard to run after a stray cat or bolt if he’s frightened by a loud noise like thunder, fireworks or a car backfiring. Or an unfriendly dog could wander into your yard during playtime and pose a safety threat. Unfenced playtime is risky at best and dangerous at worst. Do regular fence checks for areas large enough for your dog to squeeze through, and close those gaps. Is your fence high enough? Can your dog tunnel out? Think like a dog, and walk every inch of your fence looking for weaknesses. If your fence doesn’t have knotholes or spaces between the slats, your dog can’t see anything beyond it, which can result in barking, fence stalking, digging and other behavioral issues. Focus the attention on a digging area instead of your flower garden. Photography ©ukjent | Getty Images. 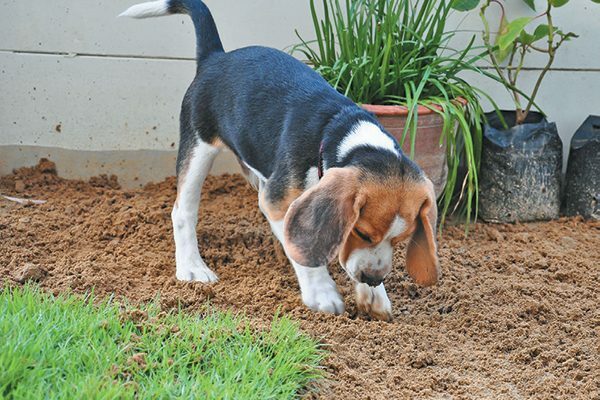 For dogs who like to dig, a flower bed or newly planted garden is an irresistible temptation, especially if you fertilize with manure or something else that smells tasty. Create a digging corner filled with fresh sand. Even easier, buy a child’s sandbox from a toy store. Look for a sandbox with a cover, so local cats can’t use it as a litter box. Bury treats and chew toys beneath the sand to encourage your dog to dig there. A simple plastic or inflatable baby pool can be a source of great fun for water-loving dogs. Sprinkler hose attachments can serve as a cooling blast while also watering your lawn. If your pooch doesn’t appreciate the fun of a good dunking, toss some stinky treats into the baby pool, and see how fast that changes! Lock away paint, fertilizer, fungicides, rakes, hedge shears, rat poison, snail bait and other backyard care essentials in a shed, or put them in an area too high for your dog to reach. Make sure your dog stays hydrated outside. Photography ©K_Thalhofer | Getty Images. Your yard should have a cool, shady spot where your dog can take a break from play when he begins to overheat. Place a water dish in that area to encourage hydration. Create enough drainage so your dog isn’t mucking in the mud on rainy days. Laying down gravel is a good way to keep mud away from furry paws. If you have male dogs, add a few “marking” features to give him a “territory.” Large rocks, tree stumps and potted trees will give your leg-lifting pooch a place to call his own. Include only those that are nontoxic and safe for pets in your yard. It’s toxic to dogs and smells just good enough to ingest. Gravel or bark are better choices. Many fertilizers are also appealing to dogs, so keep poochie away from newly planted trees and flower beds. Unsupervised backyard play isn’t recommended, but allowing your dog to let himself out to do his important business is definitely convenient. No backyard is immune to pests. Keep up to date with your dog’s heartworm medication as well, especially if your area is known for mosquitoes. Thumbnail: Photography ©Purestock | Getty Images. Nikki Moustaki is a dog trainer, dog rescuer, and pet expert. She splits her time between New York City and Miami Beach, Florida, and is the author of the memoir The Bird Market of Paris. Visit Nikki on Facebook, on Twitter, and at nikkimoustaki.com.